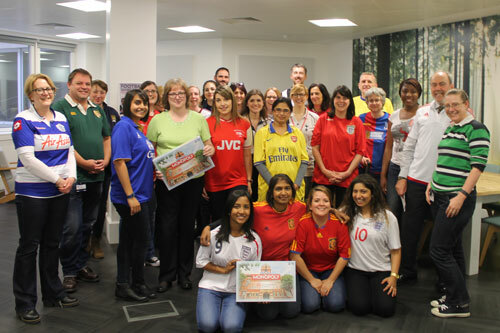 Staff across City University London wore their football shirts to work on Friday to support research into bowel cancer and to raise money for Cancer Research UK and the Bobby Moore Fund. Mainly involving the School of Health Sciences, Finance, and Properties and Facilities, staff managed to raise £900, considerably more than the £500 target. The School also hosted a ‘Spot the Ball’ competition, which was won by Maura Callan and Louise Mullins.